Americans love their good old drinks, and IPA is just another one of a delicious beer that is gulped down by thousands of people to relieve themselves of the hot summer days. The flavor is obviously enhanced by using the best glass for IPA. And now it has been especially popularized with the rise of craft beer renaissance. Old School All The Way! If you wanna go the traditional way, then you know what you need, an old-fashioned rustic beer mug. That’s right; make your cowboy movie dreams come true with a huge beer mug filled to the brim with some chilled IPA. A company that you should consider for beer mugs is Hofbrauhaus, it offers a really good beer mug, that can hold up to 1.5 liters of IPA, not to mention the quality of the material this is made from ensures durability. The product is none other than HB Hofbrauhaus Munchen Dimpled Glass Beer Stein. Practicality aside, it is also very authentic with its German-style, and perfect for Oktoberfest celebration. But if you’re feeling more sophisticated than celebratory, then there is something that is just perfect for you too! Who doesn’t love to sit in a bar and sip from a tulip beer glass? Exactly! Everyone loves it, so Spiegelau is the company you need to keep your eyes out for. 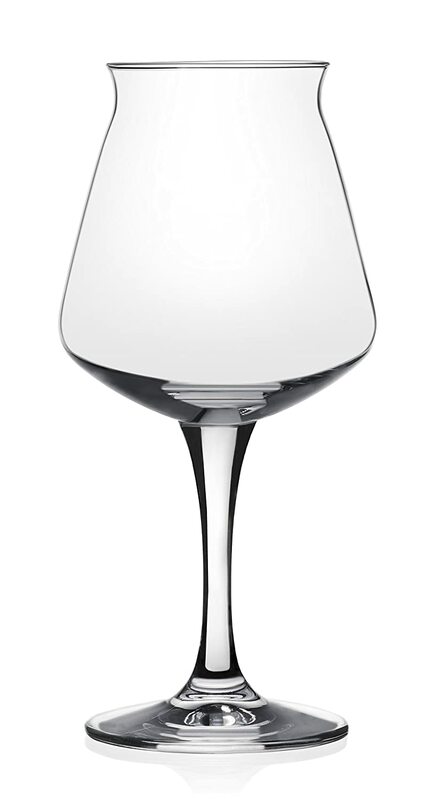 They have a range of extremely beautiful tulip glasses with the name Spiegelau 4991974 Tulip Classics Beer, that is both sophisticated and the best glass choice for IPA. 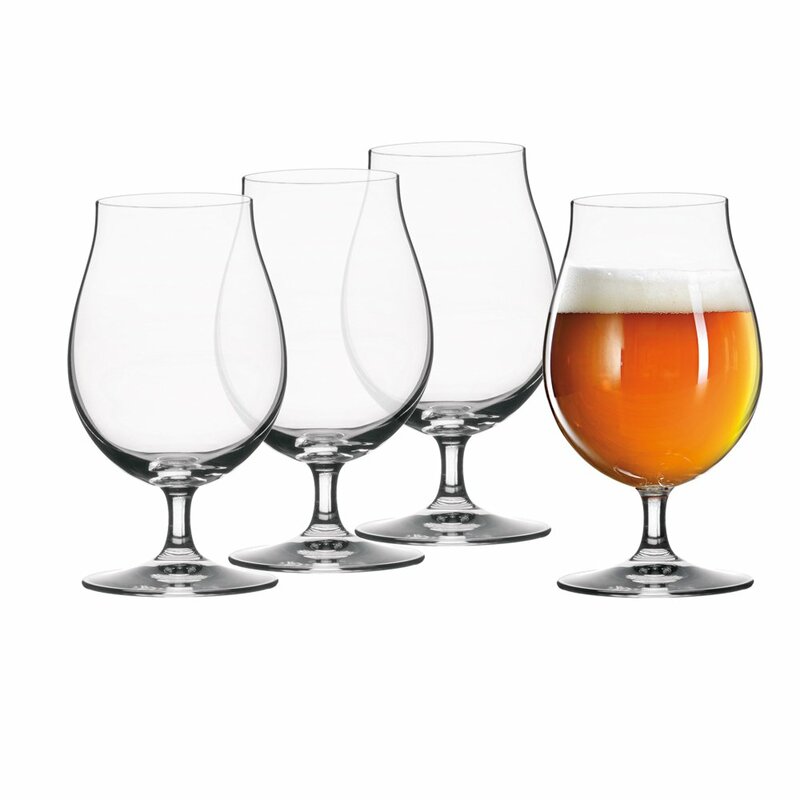 Arcoroc is also a great brand that offers tulip glasses for IPA, and these glasses are stemless and less pricey but just as elegant, with a holding capacity of 20oz, and long durability thanks to the tempered glass. Cardinal 79066 Arcoroc 20 oz Tulip Tumbler Glass – 24 / CS is one offer by Arcoroc. I personally feel that Teku has some of the best goblets in town! These are the best glasses for IPA. Especially if you are looking to have a little friendly get together with your couple friends, these goblets will let you enjoy the same hearty flavor of the hoppy beer, while also giving you that indulgent vibe. Don’t miss out Teku 3.0 Craft Beer Tasting Glasses by Rastal. If you are a beer lover, you know these sets of glasses inside and out. These large glasses actually make it feel like your glass is bottomless and the beer inside feels endless. How can something so tried and tested not be the most perfect choice? So if you are tired of thinking and deciding and you just need something quick without too much scrolling around, this is the glass for you. 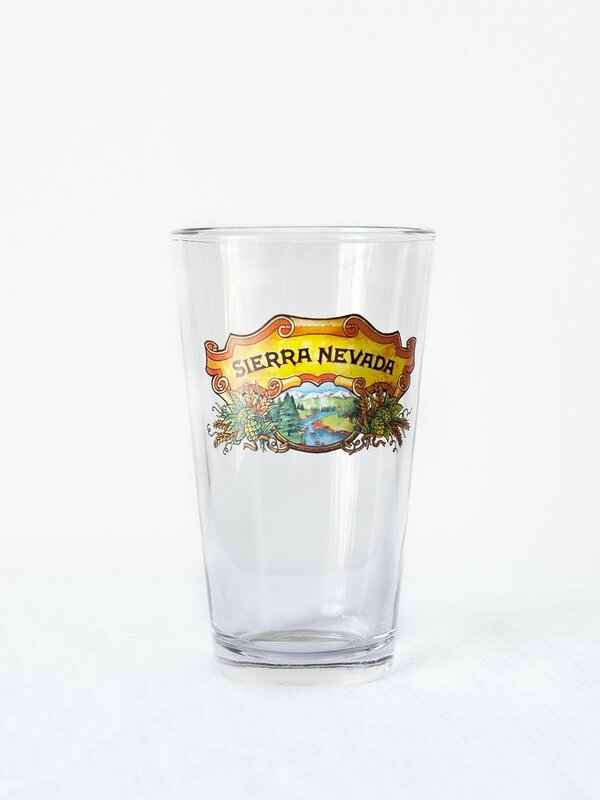 Sierra Nevada’s 16 Oz Shaker Pint Beer Glass is a classic option, with the artsy logo on one side and the ability to hold a good amount of IPA. All those advantages aside, it comes for a very cheap price tag compared to the other options, so as far as I see, there really is no downside to this. 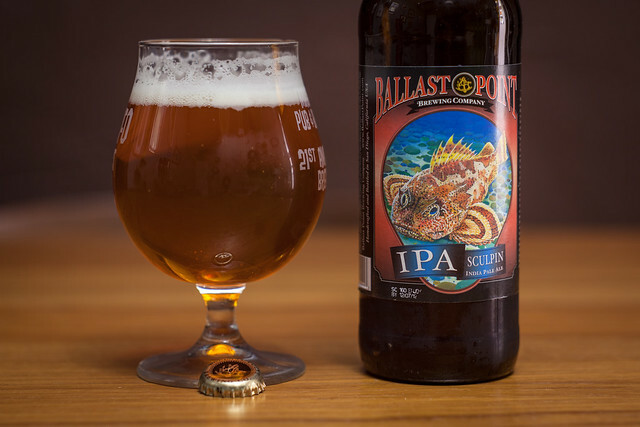 IPA’s are unique for their strong and bitter taste, and hence like most drinks, it is an acquired taste. But once you get addicted to that happy bear, it is hard to go back to something that does not give you the same kind of kick. The best thing about an IPA is how you can pair it up with some of your favorite bar foods like a chunky well-spiced piece of grilled meat with veggies and whatnot (I can feel my tummy growling). The IPAs usually come in a couple of different varieties, namely; American, Double and English. Where did IPAs originate from? The term IPA is actually an abbreviation for Indian Pale Ale, which I doubt you know is actually dated back to 1829, oh yes it is THAT old. It was probably discovered by the British when they colonized the subcontinent. In a need to preserve some brew, this new invention came about, this was so kickass, and hence soon became popular in England and other countries that were under the British control. Currently, there are a number of different countries like Canada, United States, United Kingdom and even Belgium that are involved in the production of IPAs. Obviously, each place produces a unique variety, some more bitter, some hoppier. The main ingredient that is responsible for the change in flavor is basically the hops, the flavor changes according to the amount of hop that is present in an IPA variety. For example, the Double IPA, is known for being hoppier, while the one produced on the East Coast are produced with more malt to kind of equalize the hop flavor. Don’t you prefer your wine in a deep bowled wine glass or your scotch and whiskey in a rock glass? Then how could you enjoy the fullness of an IPA in a regular glass? The answer is you won’t! In order to enjoy that perfect bitter taste, you need to be able to have big gulps without the fear of ending your drink in two sips, oh yes, we are talking giant glasses here. So are you ready to scroll through a few good options that are also budget-friendly and will do the job of giving you a satisfying drink? Even under the category of beer glasses, there are various kinds of glasses, so you can decide which one best suits your requirements and then choose accordingly. Just going to give you guys a little summary of each type of glass to make things that much more simple. So the best way to make a good choice is to acquaint yourself with the best glasses for IPA and then see the best glass for YOU! If you are a true IPA lover then you know how much a glass affects your experience of drinking this exotic drink full of aromas and that unique hoppy flavor. 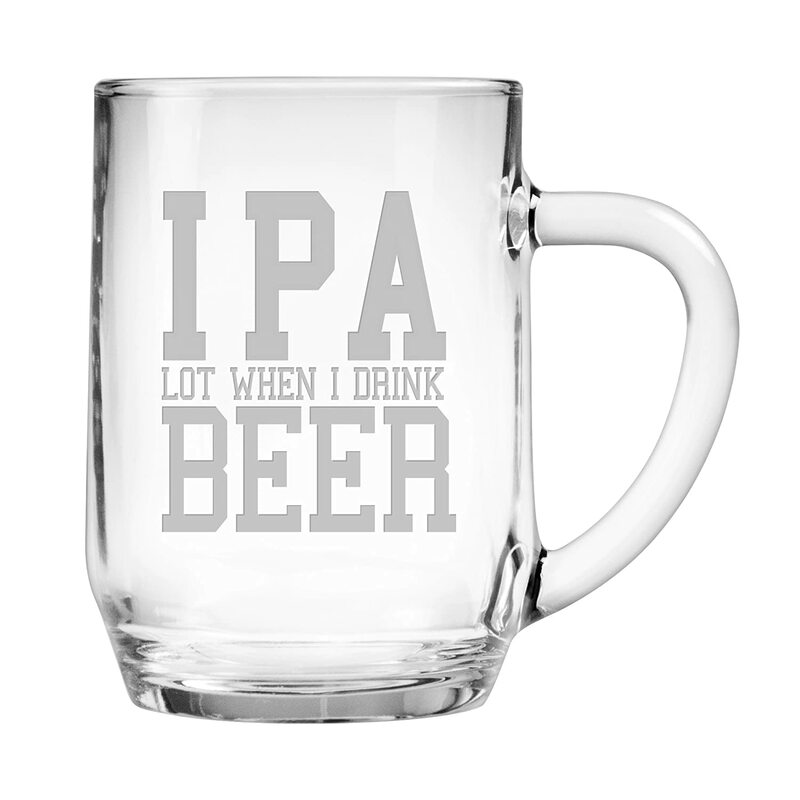 For a regular beer drinker, an investment on these glass will only prove beneficial, because it will make you feel like you’re getting the full worth of your IPA too! With the variety of options mentioned above you will be able to find the best glasses for IPA that suit your needs and requirements too. You have options from the cheaper ones and the pricier ones, all you need to do is see what works for you. Last but not least, how cute is this glass by Fineware, it has a cute funny message on top, perfect for a boys night out. Fineware IPA Lot When I Drink Beer 20-ounce Sandblast Etched Funny Glass Haworth Beer Mug, nothing but beauty it is, with all the elegance in it!